A precocious talent with a supernatural skill with melody, it’s only a matter of time until 24kGoldn hits the big time. Switching gears for a sweet love song, Goldn shares “Lot To Lose,” his latest single. Driven by snaking alt-rock guitars and booming 808s, the new single finds Goldn ruminating on a flailing relationship, commenting on the stress caused by his fame and his girlfriend’s sending of mixed messages. Though “Lot To Lose” is more subdued than his blistering single “Valentino,” “Lot To Lose” is equally impressive, as Goldn channels his emotions into a series of strong melodies and counter-melodies, culminating with an emotional guitar solo in the song’s conclusion. 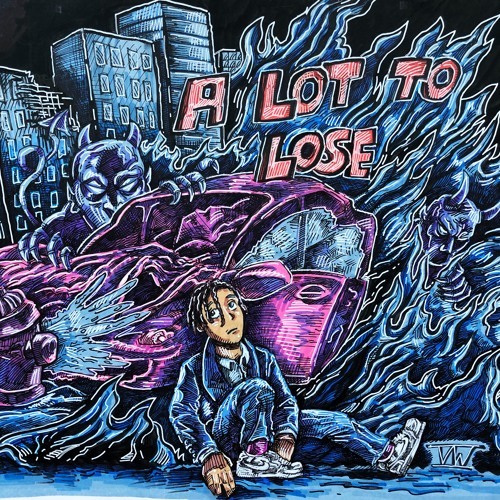 Though he’s only 18, “Lot To Lose” shows Goldn’s willingness to stretch his creative muscles and obliterate genre boundaries. Goldn is prepping his upcoming debut EP, to be executive produced by platinum producer D.A. Doman, the man behind Top 10 Billboard hits like Tyga’s “Taste” and Kodak Black’s “ZEZE.” The forthcoming effort will showcase Goldn’s prodigious hookcraft, supplemented by his breathless high-register delivery and his sly punchlines. Featuring “Valentino,” which has over 1.95 million views on its creative music video, the project arrives later this year via RECORDS LLC. Every decade, music fans are gifted a prodigy with a talent and vision transcendent of their age, from Pharrell Williams to Tyler the Creator. The next generation arrives courtesy of RECORDS LLC., San Francisco native, 24kGoldn is an 18-year-old rapper, singer and arranger who already possesses the adventurous delivery of a Young Thug and song craftsmanship of Future. Add on the fact that he is also a freshman at the University of Southern California and his special begins to crystallize.